Chemical Guys New Car Scent smells like a new car and that's fantastic. Concentrated long lasting premium air freshener with natural enzymatic odor elimination properties to eliminate odor and reduce recurring odor. Use sparingly or dilute accordingly for superior air scents and long lasting deodorizing ability. 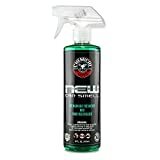 Chemical Guys New Car Air Freshener is designed to mimic the new car scent. All Chemical Guys fragrances are naturally derived and combined to emulate a new-car smell without being bad for you or the environment.